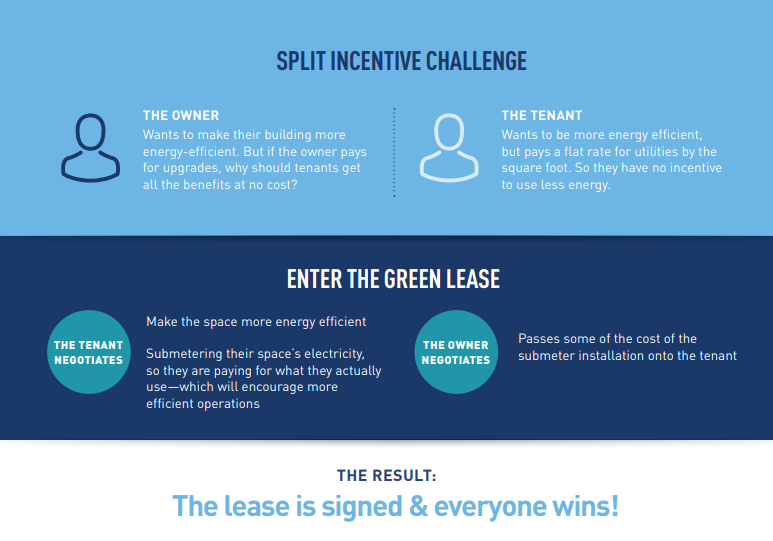 A green lease includes smart, energy-aligned clauses that unlock win-win investments in energy efficiency and sustainability. By greening a lease, landlords and tenants collaboratively transform buildings into higher-performing ones. Below is just one example of how a green lease is frequently used to drive efficiency and business benefits. The Green Lease Leaders recognition program was created with support from the U.S. Department of Energy and other Green Lease Library and contributing organizations. For more information on the program, visit www.greenleaseleaders.com. IMT and DOE’s Better Buildings Alliance are shining a spotlight on Green Lease Leader designees that use innovative strategies in their green leases and overall operations. In each case study, leading sustainability professionals share their organization’s best practices that every real estate or sustainability practitioner should consider when leasing property. 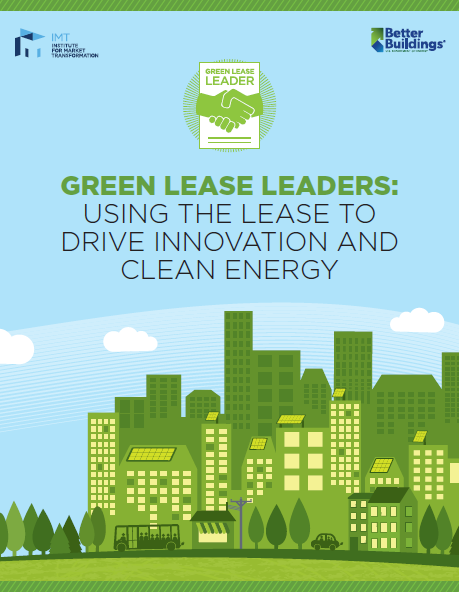 Click on the image below to read the first in the series, Green Lease Leaders: Using the Lease to Drive Innovation and Clean Energy. This website is the result of a collaboration among several stakeholders in the green leasing community (see below), and is maintained by the Institute for Market Transformation (IMT). The website's purpose is to consolidate green leasing resources to provide a one-stop-shop for all audience types-- from building owners and tenants to lawyers and building raters. The green lease library is organized by resource type, and resources are tagged by relevance to audience and building types. GreenLeaseLibrary.com, the Green Lease Leaders Program, and the Landlord-Tenant Energy Partnership are maintained by the Institute for Market Transformation. The Landlord-Tenant Energy Partnership is a collaborative project of the Institute for Market Transformation, the Retail Industry Leaders ​Association, and the International Council of Shopping Centers.